Abigail and the Kingdom of Fairs is a fresh release from NevoSoft. The game is another time-management/simulation challenge for the gamers. 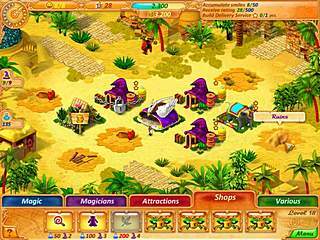 The game takes you together with the main character into another world. That is where you get to do a lot of building. So the ultimate goal of your character is to make her way back home. The story starts with a girl finding a book that turned out to be a portal to another world. Usually building simulations use a more realistic scenario, while the hidden object genre prefers all kinds of mysteries and other worlds. But that is not a problem, but rather a fresh feature. So the ultimate goal of your character is to make her way back home. She is also now responsible for saving the Kindom by building lots of new buildings and upgrading them and protecting them. In other words you are going to play another building sim following the familiar path. The items used in that world will make it taste a bit different though. You are going to build three kinds of buildings: attractions, shops and functional structures. There are monsters to protect the villages from. You are required to upgrade the buildings that you already built. The material that you need for building is magic and the builders are ... yes, magicians. The environment is different according to the location you are in. There are 5 locations that make up 50 levels. Plus there are three modes in the game which creates quite a replayability. Apart from Adventure mode, there is also Defender mode and Banker mode. The former one delivers more monsters to you, while the latter focuses more collecting the coins. 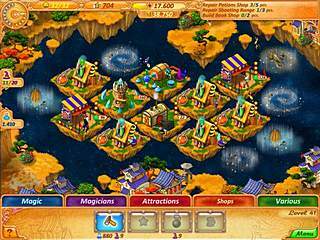 The attractions and the shops get you the revenue, while the funtional buildings are used for the general needs. For example, schools for magicians help decrease magicians' hiring rates, or the workshop prevents demaging of the existing buildings. 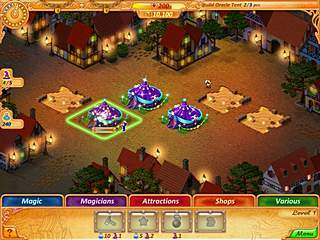 The game is bright and colorful and fairytale-like. The graphics are cute, but may seem a bit childish for some. Even though the game doesn't offer anything extraordinary and shockingly new, it is still well balanced game worth of the attention of those who like this genre. If you are in a mood for some sim building in a fairy land, this game is for you. This is Abigail and the Kingdom of Fairs review. Download this game here.